The USB interface II includes full optical isolation of all control signals (radio control, CW, PTT and Squelch) and high quality audio transformer isolation (with level trimmers) for audio to your radio's rear panel audio input and from the radio's constant level audio. 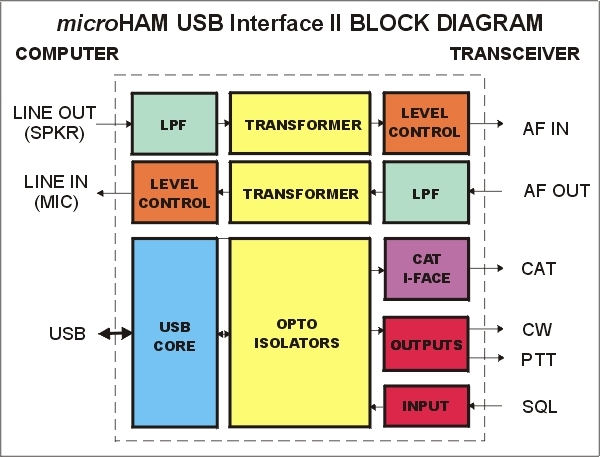 microHAM USB Interfaces have built-in hardware support for your radio - you no longer need additional level converters like CT-62, IF-232, FIF-232, CT-17. The drivers include support for software CW keying (DTR) and PTT (RTS) - there is no need for additional interfaces. Unlike common mass market computer "USB to Serial adapters" our USB Interfaces are carefully designed for maximum immunity from strong RFI and at the same time be "RF quiet". Each data line is low pass filtered for minimum interference. Package includes: micro USB Interface II™, CD ROM with drivers, control software and manual, USB A-B cable, two sound card cables, and one radio cable (specify your radio).